Help our neighborhood raise funds to furnish our new community center! Orders will ship within 10 business days of this fundraiser ending on 02/28. We designed this campaign for the practical purpose of raising money to furnish our new community center, which is scheduled to be complete in April. This is a long time dream coming true for our neighborhood! But to us, this campaign is about much more than a community center. 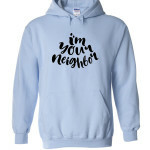 It is about neighbors. It is an opportunity to remind us who our neighbors are, and to fulfill the simple command to love them. It is possible that you do not agree with your neighbor. You might not like the color t-shirt they will choose for this campaign. 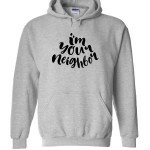 You might feel that by rocking the hoody you will be more hip than a neighbor wearing a t-shirt. 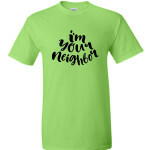 These are issues you will need to work through because the message on the shirts remains the same: I Am Your Neighbor. And the message from the Bible also remains the same: Love Your Neighbor. 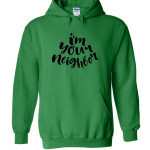 So order your shirt or hoody, wear it with pride...and then neighbor each other with dignity. 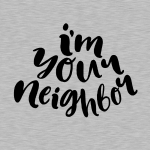 (Yes, we just turned "neighbor" into a verb.) 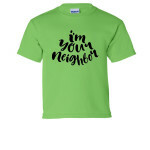 Go neighbor. Listen. Share food.. share dreams...share time. Walk away reminded that the world is not as divided as we think it might be. These people are the real deal! Love this neighborhood and the ladies who organized this sale! 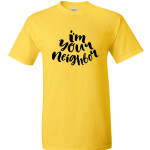 Supporting HOH and sharing (wearing) the message that we're all neighbors!